Browse tractors suppliers by country and region. 2011 JD 7530, MFWD, TLS, IVT, GREENSTAR READY, 42" DUALS, 3 REMOTES, 540/1000 PTO, AIR SEAT, JOYSTICK, DELUXE LIGHTS, REAR WEIGHTS. Cab, Air, Heat, 4x4, 2 Remotes, 540/1000 Pto, 3pt Hitch, Engine Block Heater, 18.4-38 Rear Tires, 13.6-28 Front Tires, Quad Range Trans, High/Low, 6cyl John Deere Diesel, 86pto Hp, 1570 Hours On The Meter (not actual). Rollbar & canopy, 8 speed, 1 remote, aux. hyd pump, 18.4x30 50%, 10.00-16 80%, toplink, excellent condition. Short on time? Let tractors sellers contact you. 16.9X28 (90%), 9.5X24 (90%), 1 HYD, 8X8 SHUTTLE, 725 HRS, INDEP. 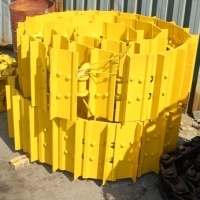 PTO, MF DL250 LDR, 72" BUCKET. Massey-Ferguson 4607M Tractor, 70HP, 4WD, with Loader, 12X12 Power Shuttle, New Equipment MF 4607M Tractor, NEW, Excellent. THIS IS THE LAST OF THE PERKINS DIESEL ENGINES,Q31 ALO-QUICKE LOADER/JOY STICK/SKID STEER SYLE QUICK ATTACHE BUCKET, 4X4,INDUSTRIAL TIRES,8X8 MECHANICAL SHUTTLE,LOW PROFILE, VERY HEAVY DUTY NEED TO SEE THIS ONE. This is as close to new as you will find a MF1742L Cab 4WD tractor with loader only 105 hours must see. Russian and chinese food equipment , food products, tea and honey, polymer sand extruder , self service car wash equipment.Analysis of product competitiveness, production costs calculation, as well as searching for potential buyers and partners, business negotiations, promotion of goods on Chinese market, logistics, import and export documentation, brokerage, tender and exhibition services. Type:2wd Model:bn800 Front tire:6.5-20/7.5-16 Rated power:58.8kw Wheel base:2362mm Rear tire:16.9-34 Dimensions:3700x2050x2700 Walking tractor can be used for land cultivation. Walking tractor is our leisurely, good fun to experience life.